Poke Cake is one of the easiest cakes you will ever bake, with the endless option of flavor combinations, you will never grow tired of them. 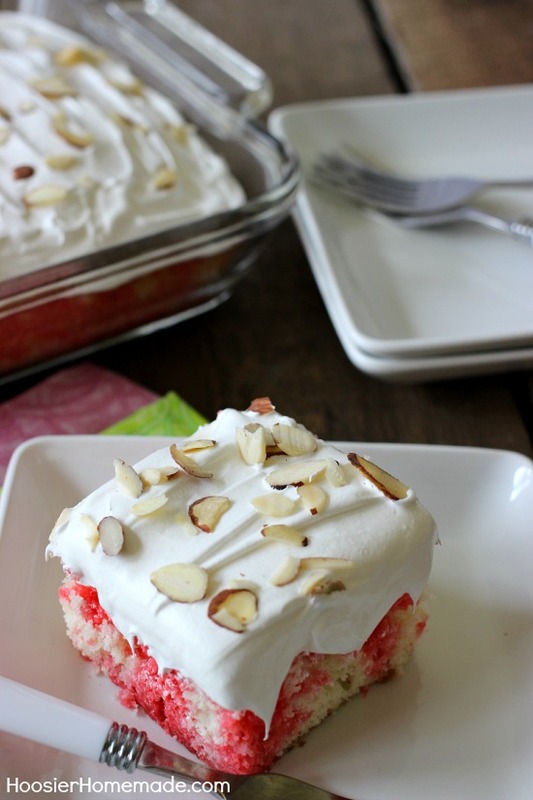 This Cherry Almond Poke Cake is light and refreshing, and is perfect for your Spring celebration! 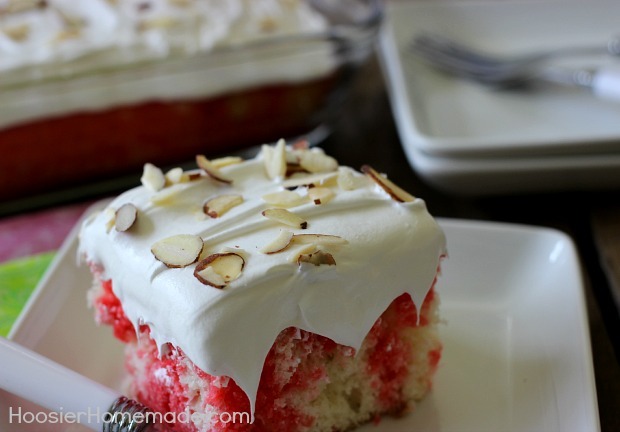 It’s been quite a while that I’ve made a cake, typically I bake Cupcakes or single desserts like Mini Cheesecakes, but with so many celebrations coming up soon – Mother’s Day, Graduations, Potlucks, Spring Parties and more – I just knew you would love the recipe for a delicious Cherry Almond Poke Cake. Okay, well, yes let me be honest, I wanted it too. What could be better than Cherry and Almonds together? 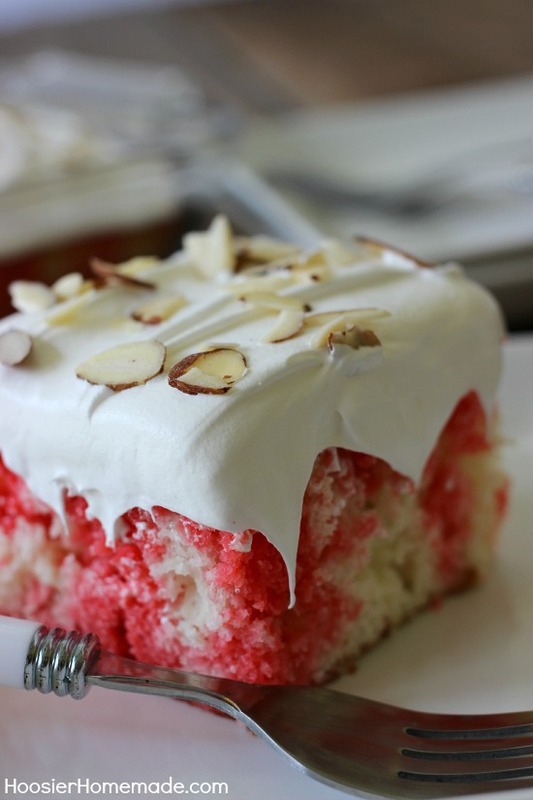 This luscious Cherry Almond Poke Cake starts with a white cake mix, in addition to the normal ingredients you add to a cake mix – eggs, water or milk, and oil – I added some Almond Extract for flavoring. Almonds have a light, fresh flavor that just screams Spring to me. 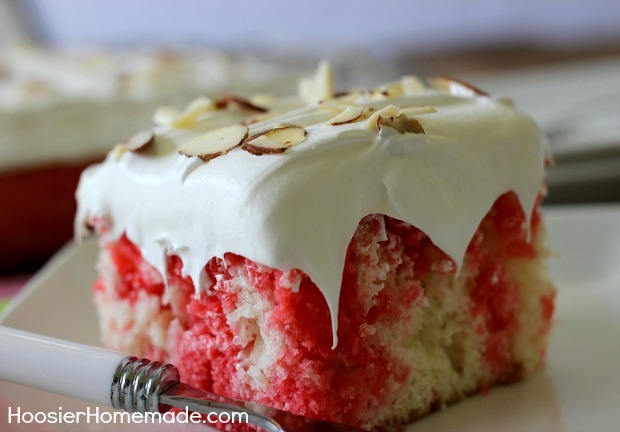 While the cake is wonderful, it’s really the frosting that is heavenly, a mixture of Marshmallow Fluff, Cool Whip whipped topping and a little more Almond Extract adds to the lightness of the cake. Then to make the cake even more special, I added a sprinkle of Fisher Sliced Almonds, the light, sophisticated taste is the perfect complement to this Cherry Almond Poke Cake, bringing out the almond flavor even more. And do you see that neat stand-up bag that the Fisher Nuts comes in? The stand-up bag is not only convenient, but it keeps nuts fresh in-between uses. 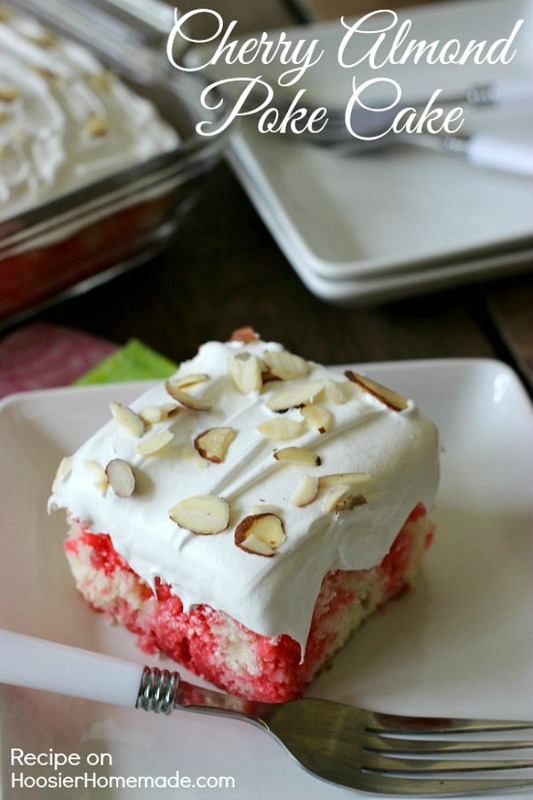 Hoosier Homemade: What is your favorite Spring dessert to serve guests? Chef Alex: I like to start with a good foundation of fresh berries that are in season, then make a simple tart. I also enjoy using Chocolate, Nuts, and Fruit together. Spring is all about tradition for me. I love Make-Ahead dishes and keeping it casual. Hoosier Homemade: Do you have any tips for making a dish more seasonal? Chef Alex: Visit the Open Market in your area, you can find a large variety of special produce there. Use produce that is seasonal, like peppers. Hoosier Homemade: What is your favorite unconventional way to use nuts in your cooking? with nuts more than sweet desserts. Hoosier Homemade: Do you have a favorite Fisher Nut for cooking and baking? Why? Chef Alex: Do I have to choose just one? I don’t think I can. I like Walnuts the most for cooking, they have a rich, creamy flavor that doesn’t take over but makes you feel full. And I like Pecans for just eating. Hoosier Homemade: Because I know my readers will want to know – What is your most memorable Food Network show? For recipes from Chef Alex, visit Fisher Nuts. 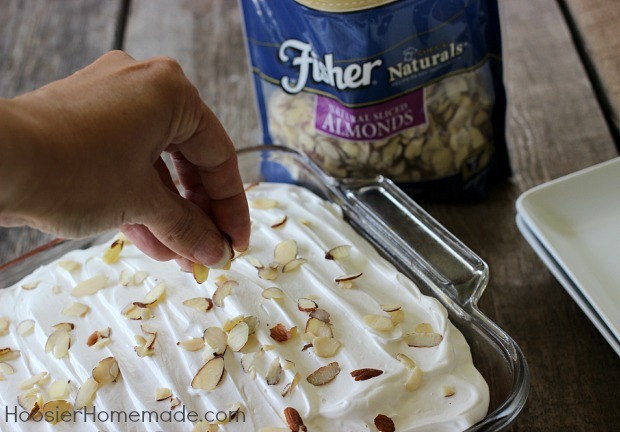 Visit Fisher Nuts for more recipes, follow them on Facebook and Pinterest for more recipes!